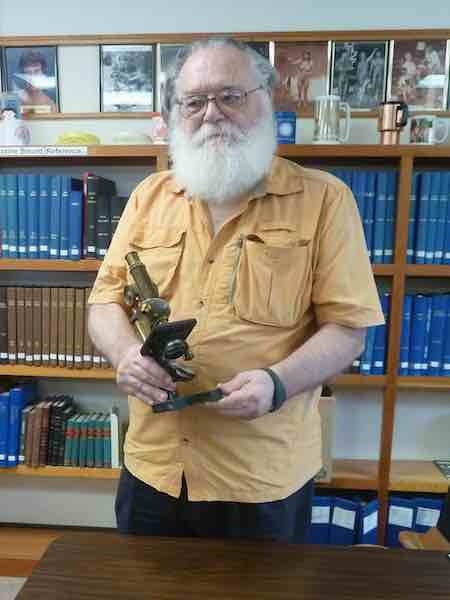 Curt Bishoff Visits ANRL | AMERICAN NUDIST RESEARCH LIBRARY ®, Inc.
Curt Bishoff (Life Member #4157) visited ANRL for it’s July 17, 2015 Board Meeting. He donated a couple very interesting items to the Library. Uncle Danny Boone’s Microscope which was used to inspect and analyze bugs. Edith Church’s Tin Box of valuable mementos and documents.